Appleseed In Action – You did it again! Your voices were heard again! On September 26, Senate leaders announced they would not vote on the latest attempt to repeal the ACA when it became clear the Graham-Cassidy health care bill did not have enough support to pass. Nebraskans joined health care advocates across the country in urging Senators to oppose the bill, which would have slashed Medicaid, forced millions of Americans to lose coverage, caused premiums to go up, and eliminated protections for people with preexisting conditions. Thank you to all of you who called or wrote our Senators, made an office visit, or otherwise spoke up to defend quality health care! Hard-working, talented young Nebraskans are one of our state’s greatest resources. Our communities have a brighter future in store when every young person has the opportunity to live, learn, work, and raise families in the state they call home. But, after the White House announced in September it would end the Deferred Action for Childhood Arrivals (DACA) program in March, the lives of nearly 3,000 Nebraska Dreamers are in limbo. Take Action! Tell our members of Congress to support the bipartisan “Dream Act of 2017” and make sure Nebraska’s 3,000 DACA youth – like Joseline and Armando – can earn a path to citizenship and contribute to the future we Nebraskans all want to build together. On September 13, the Office of Inspector General for Child Welfare released a report concerning deeply troubling outcomes in the state’s child welfare and juvenile justice systems. The report found an increase in suicide attempts and sexual abuse of children in care. Child advocates, including Appleseed, responded to the report’s findings, calling for the state to implement a number of fixes, including bringing caseloads into legal compliance and following recommendations of the Inspector General. Communities across Nebraska helped make Welcoming Week 2017 the busiest and most-successful welcoming week in the event’s history! 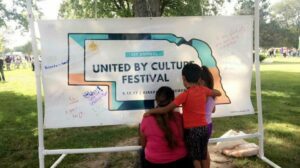 Nebraskans from Scottsbluff to Schuyler, and Hastings to Omaha held community potlucks, got to know new neighbors, and came together to show Nebraska is a better state when everyone is made welcome. On Thursday, October 19, 2017 we are excited to celebrate outstanding Nebraskans who fight for justice and opportunity at the 2017 Good Apple Awards! 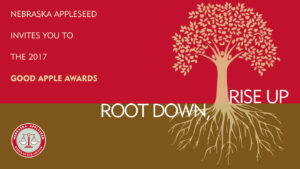 This year’s awards, “Root Down, Rise Up” will connect Nebraska’s deep roots of advocacy with the current fight for equal justice during an evening of live music, art, food, and celebration. Get tickets and read more about this year’s honorees! The open enrollment period for the Health Insurance Marketplace is coming up, November 1-December 15. The enrollment period is shorter this year, so get ready now and help us spread the word! Nebraskans again will have the chance to go online at HealthCare.gov or get free, in-person help from local Assisters to find coverage that meets their needs and budget. You can find an assister near you at this online map or by calling the free 2-1-1 service operated by the United Way of the Midlands.